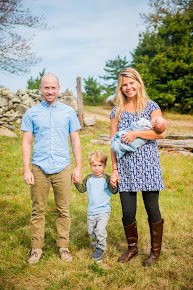 In the summer crowds swarm Menemsha with picnic dinners and blankets to watch the sun set over the ocean as it is one of the few places on the east coast where this happens. Dylan and I head over there every so often to go to the only fish market that is open around us. We visit the lobsters and are always offered (and accept) many samples of hot lobster soup. We were the only ones shopping for dinner as the sun started to set. I decided to buy some fresh flounder to make a 15 minute fish dinner and a cup of lobster soup for D. It's hard to eat enough raw greens in the winter so I experimented with this Kale Caesar Salad and am really happy with how it came out. Are you worried about the raw egg yolk? I'm sure some of you are which is totally understandable. Some eggs are scary but if you buy farm fresh eggs at the farmer's market or local stand you have nothing to worry about. Many grocery stores carry high quality eggs too but it's worth asking an employee which are the best. Look for a deep yellow or orange yolk ranging from the color of a sunflower to clementine. You'll notice conventional store bought eggs have a very dull, sad, yolk. The trick to this salad is using lacinato kale or baby kale which are more delicate then shredding them into thin ribbons. If you are not a fan of hearty raw greens you can heat a nonstick skillet to medium-high and quickly sear the salad, after fully assembled, so the leaves get slightly charred and the dressing is warm. Either way is delicious. 1. Make the croutons: Heat oven to 425 and toss 1" cubes of bread with olive oil, salt, and pepper. Lay on a baking sheet and bake for 10 minutes. 2. Make the dressing: In a blender, add the juice of 2 lemons, zest of 1 lemon, garlic cloves, egg yolk, pinch of salt and pepper. With the motor on, stream in the cup of olive oil until combined. The consistency just be that of heavy cream. 3. Prepare the kale: Pull the leaves off of the steams then gather into a tight bunch (you may have to do this in batches) then shred into ribbons with your knife. Thoroughly wash and dry the kale ribbons. 4. 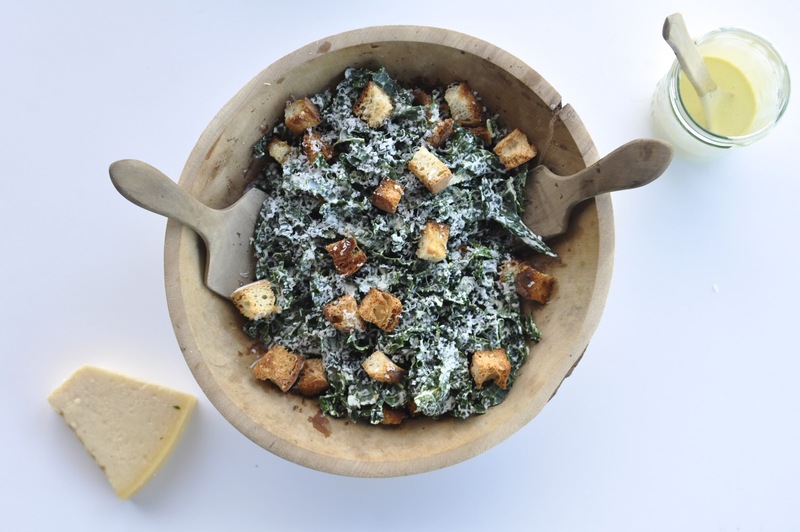 Assemble the salad: In a large bowl, toss kale with enough dressing to lightly coat the leaves (you will not use it all) then grate a thin layer of fresh Parmesan cheese over the salad, add the croutons, toss again. Finally, grate another thin layer of fresh Parmesan over the top and serve. The extra dressing can be kept refrigerated in a mason jar to be used on other salads and sandwiches. Because kale is hearty the salad can sit briefly without too much wilting and the citrus in the dressing breaks down the bite. this looks AMAZING. i need to make it asap! Yum the Kale Caesar looks so amazing! Christin - yippee I hope you do! Karen - thanks, we loved it and I'm happy to have a new easy kale recipe. I am home in Newport for the winter and I have observed the same 5 things on this island. Also, Fresh egg yolks sit higher. Maryellen - We miss you guys! Please hop on a boat and play with us. Hi Julia - I hope you do try it and let me know how it compares to Cavolo Nero. Glad you found me! doesn't go in the dressing? Julia, good question. You can save it in the fridge and add it to scrambled eggs the next morning so sometimes I just cook it up for our dog!